The month always flies by when fashion week is happening. Lots of energy goes into prep and organizing, then the shows happen, and before we know it, February is almost over. I saw a lot of great collections this season, and use this time as a source of renewed inspiration in the middle of a sometimes discouragingly cold winter. One of the events I often look forward to aside from shows is mingling with my fellow influencers at the Shopstyle Social House. As busy as we all are during this week, this is a time when we can all come together and take a little time out to catch up with each other and unwind a bit. Not to mention having the privilege to go out for a shoot with the stunning & talented Candice Lake. Alongside with her was also photographer Jason Jean. 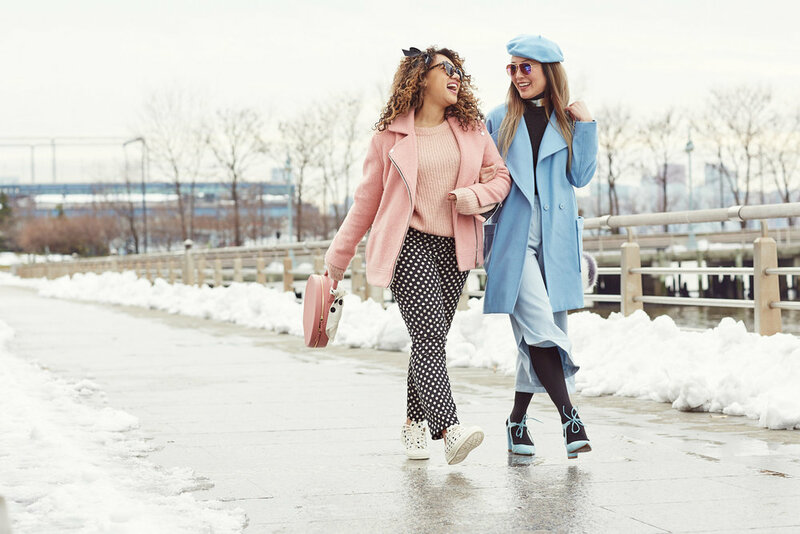 I was out with Courtney of Color Me Courtney and Annabelle of Viva Luxury, and Courtney and I happened to be head-to-toe in pastels! It was a perfect duo of monochromatic color-coordination, and such a fun experience shooting with everyone. Monochrome is one of my favorite styles (I want to say trends, but it is timeless) to wear because it's a simple way to make a big statement. You don't have to think much about color coordination or matching patterns since it's all the same - just pick a color and find your pieces. I've listed several options below to help you jumpstart a baby-blue monochromatic look of your own, but you can choose any color you like of course. Have fun with it! Thanks for subscribing! Say hello whenever!